Since its founding around 70 years ago, TLV's goal has been to produce dependable, long-lasting steam traps. One early outstanding success was the A3, a thermodynamic steam trap offering an amazing 10 times the durability of previous products. Behind the A3 was the concept of the 'Trouble Less Valve', from which the company name originated. From this solid foundation, the line of products and services has continued to expand, and TLV has become a Steam Specialist Company - a recognized leader in the steam-engineering field. 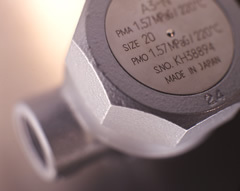 A benchmark product, the A3 was the world's first steam heating, condensate cooling, double-jacketed thermodynamic steam trap, unaffected by ambient conditions. From this product alone came 7 patents. The A3 evolved into the A3N with the addition of an integrated air-venting feature. From single trap-design beginnings, TLV now engineers complex systems such as the Vacuumizer - a vacuum pressure steam heating and cooling system.